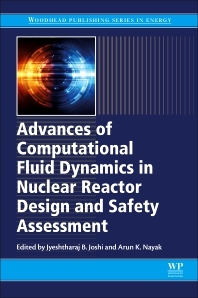 Advances of Computational Fluid Dynamics in Nuclear Reactor Design and Safety Assessment presents the latest computational fluid dynamic technologies. It includes an evaluation of safety systems for reactors using CFD and their design, the modeling of Severe Accident Phenomena Using CFD, Model Development for Two-phase Flows, and Applications for Sodium and Molten Salt Reactor Designs. Editors Joshi and Nayak have an invaluable wealth of experience that enables them to comment on the development of CFD models, the technologies currently in practice, and the future of CFD in nuclear reactors. Readers will find a thematic discussion on each aspect of CFD applications for the design and safety assessment of Gen II to Gen IV reactor concepts that will help them develop cost reduction strategies for nuclear power plants. Dr. Nayak received his PhD from TITech, Japan in 2000 in Nuclear Engineering, and his field of Specialization is Nuclear Reactor Thermalhydraulics and Safety. He has received multiple awards, prizes and honorary degrees throughout his career and is a life member of the Indian Nuclear Society and Indian Society of Heat and Mass Transfer. He has published over 73 peer reviewed articles and 140 conference proceedings.